Geared Hubmotors have a set of planetary gears between the motor rotor and the outer hub that multiply the torque by the ratio of the planetary gears, typically about 5:1. In simple terms the wheel has 5 times the torque of the motor. That allows a smaller motor to produce more power. And it gets better. Gearing the motor down provides a significant improvement in climbing hills and lower speed efficiency. Generally below about 22 MPH a Geared Motor has higher efficiency than a Direct Drive. Even better there is no cogging; that's due to the overrun clutch that only engages the motor when its powered. The drawback is you won't get any Regen or drag going down hills, nor can the motor offer a reverse. However if you're only averaging speeds of 18 MPH or less, or you're spending a lot of time climbing hills, the higher level of efficiency will more than offset any Regen energy you'll be missing out on. Adding the complexity of a planetary gear set and overrun clutch isn't free, there are a few costs involved beyond a few dollars. First the gears & clutch typically have a life of about 3000-5000 miles and cost about $60 to replace. Second, gears add to the audible noise a little under power, although the motors are silent when pedaling without power because they don't turn. 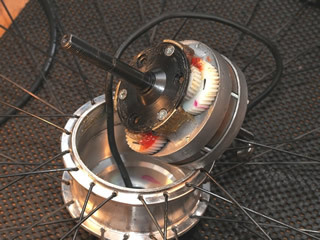 All of the Geared Hubmotors will require an external controller. The ideal computer to use is the Cycle Analyst. Going a step further with the Thun Torque Sensing Bottom Bracket will provide the ideal system for the majority of trikers looking for a boost on hills without breaking the bank. Efficiency of a Geared Hubmotor favors lower speeds than the Direct Drive Hubmotor. Both have zero efficiency when powered but not rotating; however at low speeds like under 6 MPH the Geared Hubmotor is rotating 5 times faster (depending on the internal gear ratio). Electric motor design allows a fairly wide efficiency zone compared to say a gas engine or even the human leg. Hill climbing assistance at speeds below about 12 MPH is best handled by a Geared Hubmotor or even a Mid Drive rather than a Direct Drive Hubmotor. Higher efficiency on a climb translates to less power consumed (smaller battery) and lower heat generation rates that will limit how far you climb. Taking that to extremes, say you ride up a 10% grade climbing 500 feet at 5 MPH; many of the Direct Drive Hubmotors will overheat in these conditions. If they have an internal thermal sensor they'll typically go into a "scaleback" mode reducing power and eventually shutting down. However increasing the speed from 5 MPH to 12 MPH a Direct Drive will be in a higher efficiency zone and can likely climb the hill so long as the battery and controller can supply enough current. Any way about it the Direct Drive will require more power then a comparable Geared Hubmotor which means the range is compromised with a Direct Drive Hubmotor for hill climb purposes. Despite the Regen capability of a Direct Drive, it simply won't recover enough energy on the downhill to compensate for the lower efficiency. On the other hand riding on mostly flat terrain at speeds of 20 MPH and over Direct Drive Hubmotors will are a little more efficient mostly due to the friction in the planetary gears and partly due to the efficiency zone the motor was designed to run at. Speeds above about 25 MPH will strongly favor the Direct Drive, mostly due to the designed efficiency zone. Mid Drives can be efficient at both low speeds and high speeds so long as the rider uses the proper gearing and is discussed at more detail in the Mid Drive Primer. Keep in mind these are all generalizations of the characteristics as many motors offer different windings which affect their efficiency zones. Freewheeling Hub refers to a different characteristic then Freewheel vs Freehub. 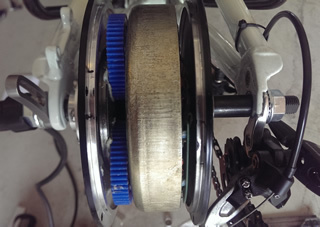 On a Geared Hubmotor there is an internal overruning clutch mechanism that allows the hub to roll forward free without engaging the motor, similar to the way the pedals don't turn when rolling forward unless you pedal. No cogging drag, in fact on the flats and downhills pedaling feels like there is no motor at all. In the event you want to ride without motor assistance or you exceed the range of the battery you won't be penalized with motor drag. Of course that also eliminates the ability to Regen and reverse using the motor, but for many that's a more than acceptable trade-off. External Controller is required for a Geared Hubmotor as there is no room inside for an Integrated Controller. 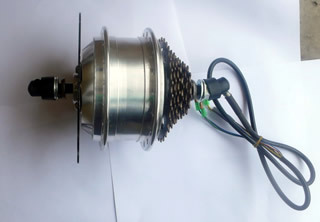 While there are controllers that may operate in a "Sensorless Mode" which don't need Hall Effect wires connected, they don't work well with Geared Hubmotors as the higher rotor RPM may defeat the ability to operate efficiently at higher speeds. Audible Noise level reduction provided by a Sine Wave vs the louder Square Wave will not make a Geared Hubmotor silent; it does reduce noise level (which isn't bad to begin with) but not enough to spend the extra $$. Reliability and Maintenance is a little more involved with a Geared Hubmotor. From numerous responses at Endless Sphere it would seem the average life of the Planetary Gears and Overrun Clutch is between 3000-5000 miles. Less if the motors are abused, more if they are pampered. It is wise to add some about a table spoon of grease about every 2000 miles which means removing the Hubmotor, pulling 6 screws, sliding back the cover plate and wiping grease on the gears. Planetary Gear sets and the Overrun Clutch are "drop-in" parts with the cover plate removed and typically cost about $60. Takes about as much time as replace as a rear derailleur. Weight of Geared Hubmotor is less than that of a comparable Direct Drive Hubmotor. The MAC Geared Hubmotor comes in at under 10 lbs yet delivers more power than most 16-18 lb Direct Drive motors. Typically you'll only need about 3/4 the size of battery for the range as well which for the average rider means about 8-10 lbs less weight added, and lower battery cost. Limited Selection of Geared Hubmotors compared with Direct Drive systems at least of what you'll find as "easy to order" in the USA, there are a few different sizes worth mentioning. Some of the smaller motors are actually quite stealthy and light weight although they are also lower power. Even with higher internal gear ratios the smaller package has less mass to build heat and at low speeds less surface area to shed the heat. 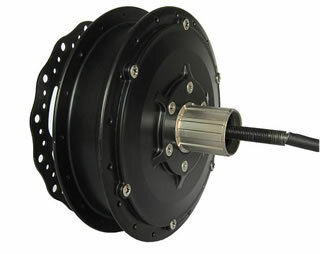 At 6.5" in diameter its hard to tell this hub has a motor. Don't worry once you're up to speed you'll hear it. At $150 you'll get what you pay for. With a smaller sized battery this package can add as little as 10 lbs total. Kept to 350 watts it will give a little bit of boost to climb a hill, but even with a 14:1 internal ratio it will be slow and begin to overheat after about 150 feet rise of climbing up about 6-7% grade. While it comes in either a fast wind for 20" wheels or a slow wind for 26" wheels its upper speed limit is about 18-19 MPH. Common in the power limited Euro market there aren't many folks in the USA who seem to like them, but its worth mentioning. Don't let the price fool you; it will have to be sourced from a vendor in China so plan on spending another $125 in shipping, and fabricating your own cables. Similar to the Cute motors this one is hard to source, so caveat emptor. Small as it is, several folks in Europe have found it will hold up to 500W nominal power which is impressive for a small motor. 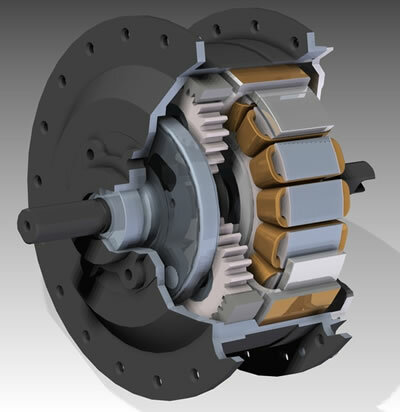 The MXUS also features helical gears which run much quieter than spur gears found in all the other Geared Hubmotors. With a Sine Wave controller this hub is reported to be very quiet. Note the cable exits the sprocket side - good for stealth, but a potential reliability issue too. 9 and 10 speed freewheels will require some spreading of a 135mm dropout and leave very little room for the axle nut with the required spacers. Probably the most stealth motor that has enough power for a trike. Bafang manufactures quality products and has several US dealers who handle their mid drives, but their hub motors never really caught on in the USA so sourcing is a pain. Having the cable exit the sprocket side is not preferred for reliability however this is probably the best choice for those needing Freehubs to mount a cassette. Probably one of the highest production units in the world, the vast majority are sold in China with a good number going to OEM E-Bike manufactures with a private label. Touted to be one of the most efficient this motor is both stout and powerful. 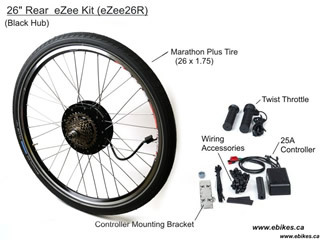 Grin Technologies is the supplier and among the highest rated sources for E-Bike Kits in North America, which eliminates much of the risk in dealing with a supplier from China. As a kit with controller and throttle its pricey at $850 although unlike the rest this one is manufactured in Europe. What you see in the picture is the base package and all components are high quality. They will also provide excellent support making the installation very "Ezee". Reported to be a very reliable system with exceptional support. My personal favorite this is the "King-Kong" of Geared Hubmotors. EM3ev retails these motors from Hong Kong yet provides a level of customer service beyond expectations. Air freight costs will run about $100 to the USA and take about 9 days. The MAC 10T was chosen for a long term test on an HPV FS26. Click the link to read the comprehensive Mac 10T Review.